This post was made possible by DVDFab through compensation. The actual contents and opinions are the sole views of the author, who maintains editorial independence, even when a post is sponsored. For more details, please read our disclaimer. There is nothing worse than buying an expensive DVD or Blu-ray disc of your favourite movie or TV show, only to damage it down the line. And while Blu-rays are less susceptible to damage with age, DVDs will get scratched to a point where you simply can’t use them anymore. One of the best practices you can have is to create backups of physical disc that you own — and enjoy viewing the digital copies while keeping the originals safe. DVDFab Copy Suite ($90 for a 1-year license) for Windows promises to make the whole process simpler. From the makers of DVDFab Media Player 2, the suite includes DVDFab’s DVD Copy and Blu-ray Copy software, which let you copy or clone DVD and Blu-ray to your hard drive as ISO files, movie folders, or burn them to blank DVD/Blu-ray discs. 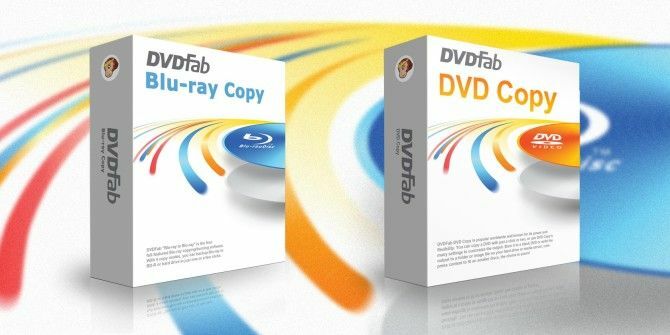 We’re giving away ten 1-year licenses for DVDFab Copy Suite (valued at $900!). Continue reading to find out more about what this program can do, then join the competition to win a free copy! It’s pretty easy to set up the Copy Suite. You will be given a key, which you have to register at the Member Center on DVDFab’s website. You’ll only have to download one setup file for both DVD Copy and Blu-ray Copy. Run it and follow the on-screen instructions to install the program. When it prompts you for your registration ID, key in the details you got online and you’re good to go. The splash screen of Copy Suite offers four basic options: copy, rip, convert or create. This way, you can quickly select the task you want, but if you change your mind later, don’t worry—these are all available as tabs in the program’s main window. The ripper is only available as a trial version, but you can skip that and use some easy and quick DVD rippers for Windows Easily & Quickly Rip DVDs With These Windows Apps Easily & Quickly Rip DVDs With These Windows Apps People have been ripping DVDs for years, so most people assume it's an entirely solved problem. That’s not the case. Searching Google for "rip dvd" will present a variety of options and articles. Some are... Read More . You can copy a disc to several output formats, whether it’s DVD-5, DVD-9. BD-5, BD-9, BD-25 or BD-50 — and you can save it as an ISO too. Of course, it’s best to do a 1:1 copy so that the picture quality stays optimal, but if you want a smaller-sized disc, DVDFab will compress the file according to your choices. This is the quick and simple option. As the name suggests, this performs a full backup of your DVD or Blu-ray disc. You can choose the source (ISO or optical disc drive), rename the volume label, copy just the DVD video or include non-DVD files, select audio, remove menus and play the titles continuously, and remove “annoying PGCs (like FBI warnings)”. Automatically skips trailers, interviews and other extras on the DVD to smartly pick up only the main film for you to copy. This is for advanced users who want to select exactly which aspects they want to copy. Divided by title, play time, chapter, audio and subtitle; you should have a pretty clear idea of which parts you want to copy and those that you want to skip. The Preview pane at the side will show you selections so you can be sure. Want to copy a BD-25 on three BD-9 discs? The Split option shows you two columns for each disc’s chapters, and all you have to do is select the arrangement. Of course, DVDFab already does it by default, but this is just in case feel like customizing. If you have multiple sources and want to merge into one DVD, this is the easiest way to do it. Want to create an exact 1:1 replica of the original source? It doesn’t get simpler than this option. The Converter lets you convert files on your hard drive into different file formats. If your DVD or Blu-ray is encrypted — and chances are, it is — the converter won’t work. I tried DVDs from back in 2000 and even those have encryption, so you won’t have much luck there. But for converting unencrypted files into different formats, the Converter is pretty nifty. The cool feature is that it offers to let you choose the device you want to convert it for, such as an iPhone or the Kindle Fire, saving you the trouble of choosing the right resolution or other settings. Just find your device and you’re done. Of course, if you want advanced options, you can get that too, including the video and audio codecs, frame rate, sample rate, resolution, bit rate, encoding method, video quality, volume, subtitles, and channels. Set it up the way you want and hit the button to start encoding. You can also resize or crop your videos to your liking. If you have a bunch of video files and want to make a DVD or Blu-ray, the Creator tab will let you do that. Just add your files (it supported every format I tried, from HD MKVs to tiny RMVBs) and choose the length of the disc — it’s set to DVD-5 by default. There’s also a built-in menu creator with a few templates, and a simple drag-and-drop interface to get things done. I didn’t care much for the templates though, they look either gaudy or outdated. At $90 for a 1-year license, it’s a tad expensive, but the number of options that DVDFab Copy Suite provides and smartly executes is something that I haven’t seen any of the freeware programs offer. So there’s no doubting the merit of paying for this software if you want a good disc copying solution. How do I win a copy of DVDFab Copy Suite? This giveaway begins now and ends Friday, November 29. The winners will be selected at random and informed via email. Explore more about: Blu-ray, MakeUseOf Giveaway. External HD, Google Drive or Dropbox. Additional hard copy & external hard drive. I bach up important media to an external HD and Dropbox. I'm planning to use external hard drives. I like it to be able to copy Blue Ray and normal DVD's for personal use. To store all our family DVDs in one central location. Don't have software for this, hoping to win! Depends on the media. Videos and music are ripped to an external hard drive to be played via Plex. Other files are stored in the cloud. External hard drive and many small USB drives. I have a very old external hard drive at this time. I currently use DVDFab HD Decrypter and Handbrake to transcode to a hard drive. Carl Smith I keep my media backup off-site with a incremental backup weekly a full backup on a secured portable hard drive, and also a incremental copy kept in cloud storage. I have all tasks automated to run during overnight idle hours and once completed, I get a completion report sent to my email addy. I do not have one. Hoping to win the above. Best DVD copy I have ever used....contact with DVD Fab as been top notch even when they really didn't have to help me with a past issue. I recommend DVDFab all the time. I don’t currently have a media backup strategy. I run two separate full back-up programs to external USB3-3TB HD's. One on a daily/incremental basis and both on a weekly full BU. I don't currently have a media backup strategy. Backup to an external FreeNAS I have made with old parts and Big Hard drives once a month. I backup my media on external drive as well as cloud. I have a NAS server with 4 large RAID drives, it can be streamed from there if requires. When ever I get a physical optical disc. I always backup it to my external hard drive. I run SyncBack Free every night at 3am. Have wake timers set to wake up my PC, have it run 10min after it is supposed to wake, and it backs up to an external drive. I actually store my media on 1 computer and back it up to another. Neither computer has write permissions to both the source and the backup due to new ransomeware that encrypts your entire drive and all mapped network drives/removable media and then holds the encryption key hostage for $300-$2000 (Kryptolocker). It has been making its rounds at my work. I as of now I don't back up files. My media back up is, an external drive with plenty of capacity (3TB) for media files, and back-up DVDs for media programs.